Opening on 20 July 2017, 6.00 p.m.
By launching the Kunstmarkt Köln, today’s Art Cologne, as the first art fair for Modern and Contemporary art in 1967, the city of Cologne experienced a major impulse on its way to becoming an arts capital. Therefore, this exhibition’s focus is both on the art fair itself as well as on the events and happenings, which stood in direct opposition to the fair and were even triggered by it. 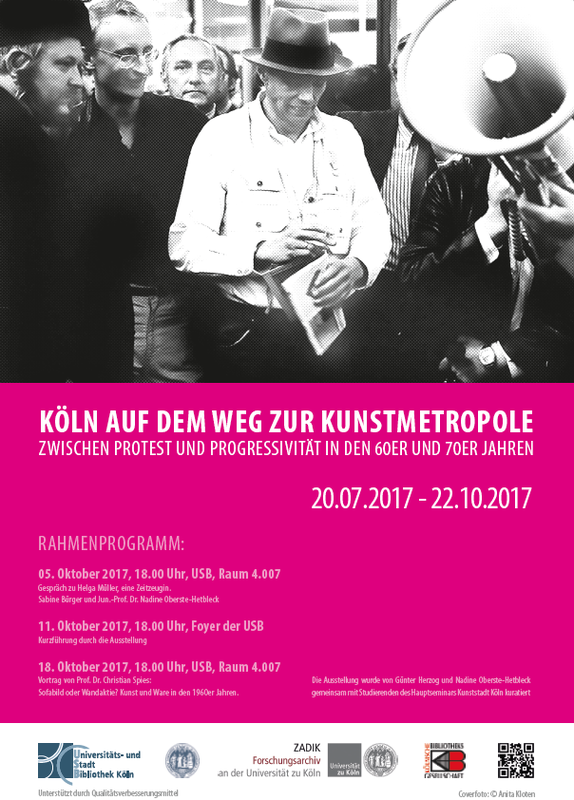 The “Straßenaktion der Organisation für Direkte Demokratie durch Volksabstimmung” (see cover photo), initiated in 1970 by Joseph Beuys, Hans Peter Alvermann, Wolf Vostell, Klaus Staeck and gallery owner Helmut Rywelski, can be seen as a prominent example for this. In addition, selected protagonists from the prosperous gallery and art trade scene of the late 60s were examined: what happened over the course of the democratization of art in those years, which were shaped by vigor, progressivity and protest? The exhibition was curated by students in conjunction with Günter Herzog and Nadine Oberste-Hetbleck. The exhibits are shown in dialogue with the video-text portrait “Helga Müller – ein Fragment” by video artist Sabine Bürger.